Redwood City, Calif. - January 18, 2012 - Qualys Inc., the leading provider of cloud-based IT security and compliance management solutions, today announced the availability of its new and improved FreeScan service to help small and medium businesses (SMBs) audit and protect their web sites from security vulnerabilities and malware infections. The new FreeScan service allows SMBs to scan their web sites for of malware, network and web application vulnerabilities, as well as SSL certificate validation, helping web site owners identify risk before hackers do in order to prevent data beaches and protect online visitors from infections. The new FreeScan is now available at: https://www.qualys.com/audit. As web sites grow ever more complex and users spend ever more time online, cybercriminals are stepping up their game to focus on exploiting legitimate sites – and the trust placed in those sites by users. Techniques such as cross-site scripting (XSS) and SQL injection attacks enable hackers to take control of web sites “behind the scenes,” redirecting users without their knowledge in order to steal data or spread malware. 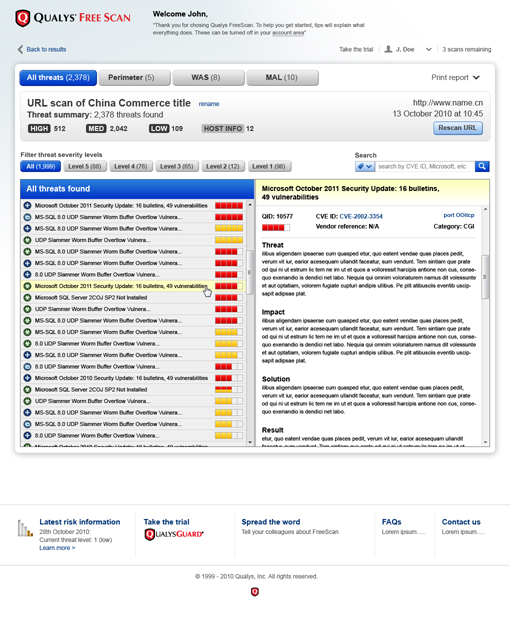 The scan results also provide guidance on remediation to fix identified vulnerabilities and remove malware infections. “In our continuous effort to make security and compliance easy and affordable, we’re pleased to expand our popular FreeScan service so smaller businesses can protect their internet presence as larger enterprises do,” said Philippe Courtot, chairman and CEO for Qualys. Qualys FreeScan is available now to users who register at https://www.qualys.com/audit. FreeScan allows each customer to run up to five scans on their web sites or publicly facing IP addresses at no cost. Qualys, Inc. is the leading provider of cloud-based information security and compliance solutions with 5,500+ customers in 85 countries, including 50 of the Forbes Global 100. The Qualys cloud-based platform and integrated suite of applications helps businesses simplify security operations and lower the cost of compliance, delivering critical security intelligence on demand and automating the full spectrum of auditing, compliance and protection for IT systems and web applications. Founded in 1999, Qualys has established strategic partnerships with leading managed service providers and consulting organizations including BT, Dell SecureWorks, Fujitsu, IBM, NTT, Symantec, Verizon, and Wipro. The company is also a founding member of the Cloud Security Alliance (CSA).